I love autumn. The weather is cooling down, there's a wee bit of rain and the green tinges are broadening and beautifying the ground. 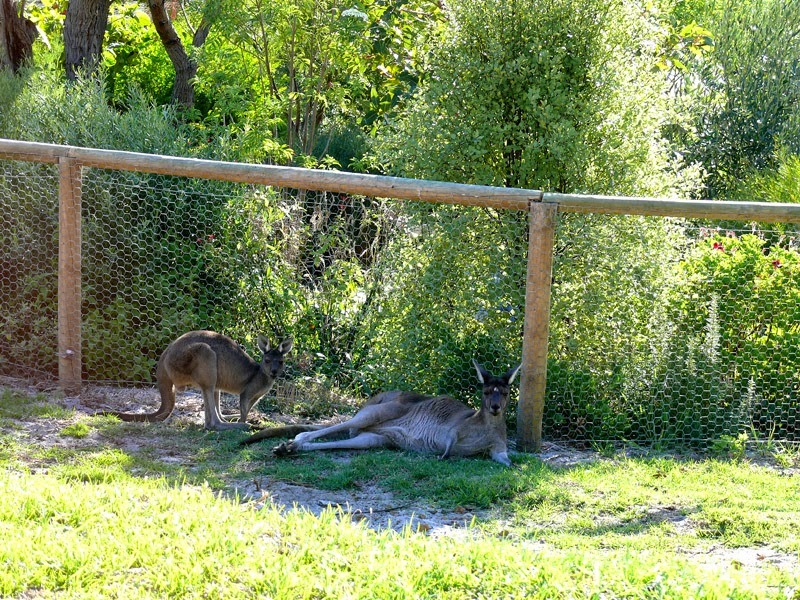 The kangaroos are happy as there is grass to eat, so they spend more time lounging around looking satisfied with life. We took the nets off the fruit trees now that the fruiting season is finished. 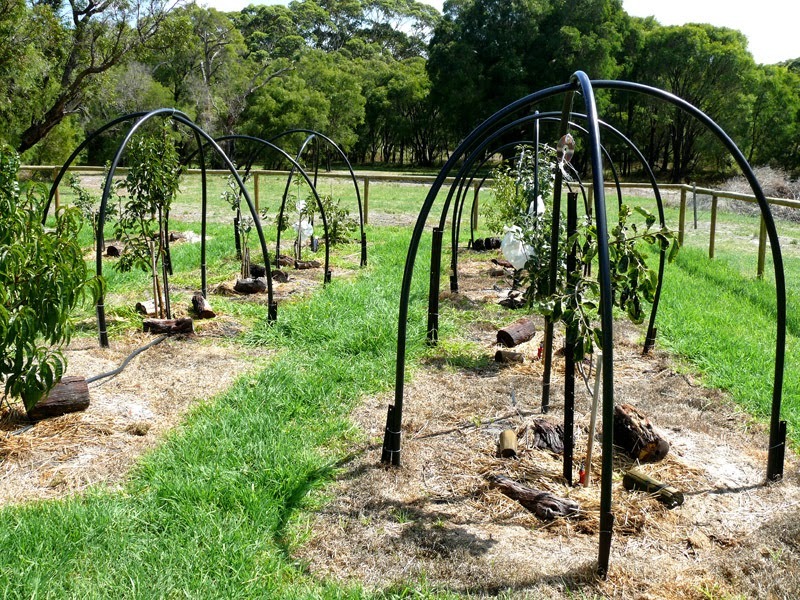 That system of poly pipes over the trees with the nets draped over those worked well as the trees are still tiny, but we are still thinking of getting the whole orchard netted in the next couple of years. 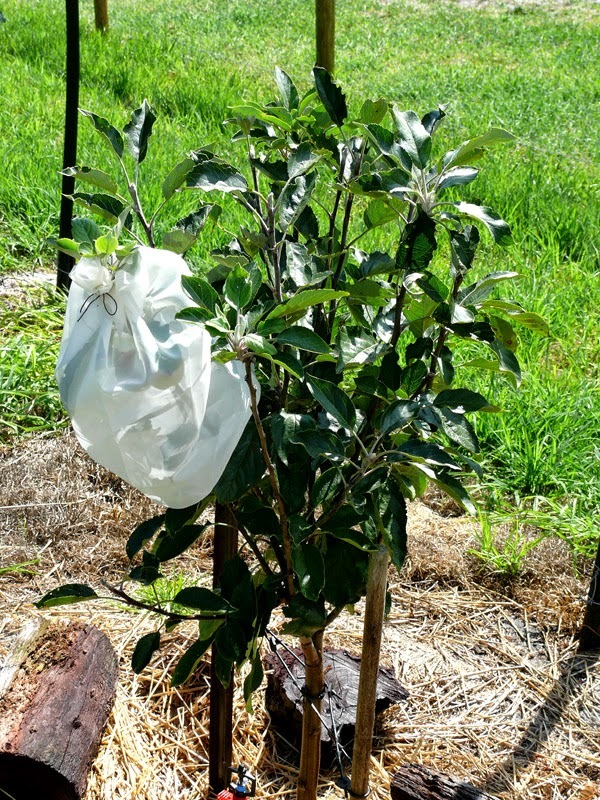 There are still a couple of apples on the trees, and as our total fruit production was about 2 dozen pieces of fruit, a couple of apples are worth protecting! I've wrapped the branches with a tube of old net curtain and tied the ends, it will be interesting to see if it foils the green parrots. We spent some time with orchard maintenance with the nets coming off and mowing the suddenly long grass. 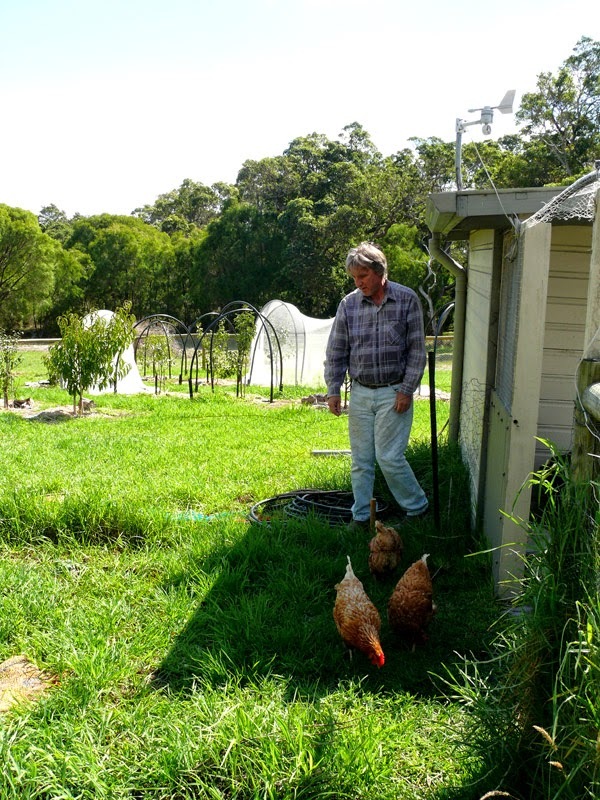 We also removed the temporary fence that keeps the chooks out of the orchard, we wanted the trees' roots to get settled in before we let the little feathered tyrants in there, it's amazing the holes they can dig around the base of trees! They weren't interested at first, staying close to their house. Finally one plucked up the courage to follow me out into the orchard. I forgot to mention, we lost another one last week :-( Same situation, she got poorly and stopped eating and was gone within three days. We are not exactly sure how old our girls are, we think they are about three or four, but maybe they are older, I believe the hybrids only live to five or six. Anyway, we are down to three now, we have Anne, Angie and Angelina (how about that, the three As) left. 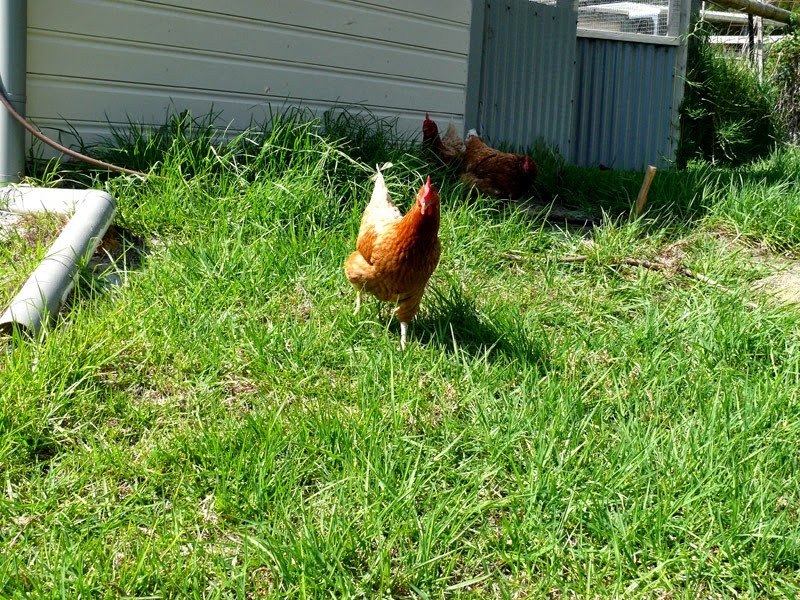 Next time we get more chooks, we'll buy 'point of lay' young birds so we'll know for sure how old they are, but for now our three ladies have the range of the orchard at their disposal. 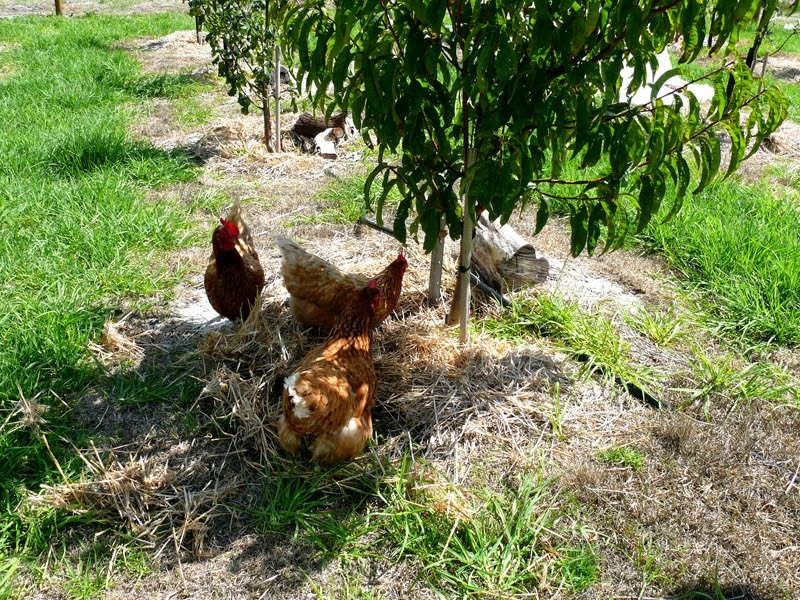 Here they are throwing the nectarine tree mulch all over the place, having a lovely time gobbling up worms and grubs. They thoroughly enjoyed themselves until a magpie swooped them a couple of times, then they went all shy and put themselves back in their yard. It wont take them long to get brave I'm sure. 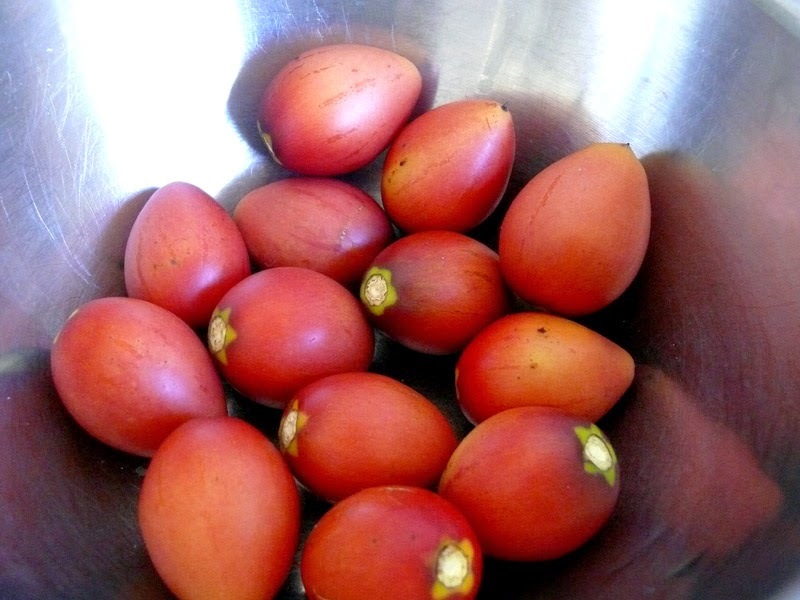 I have also been harvesting my tamarillos, also known as tree tomatoes. I made a batch of tamarillo and apple chutney which is now maturing in the pantry for a couple of months. I had a little taste and it is very sweet, hopefully it will mellow down with time. A lot of people don't know what tamarillos are, this is what they look like cut open. 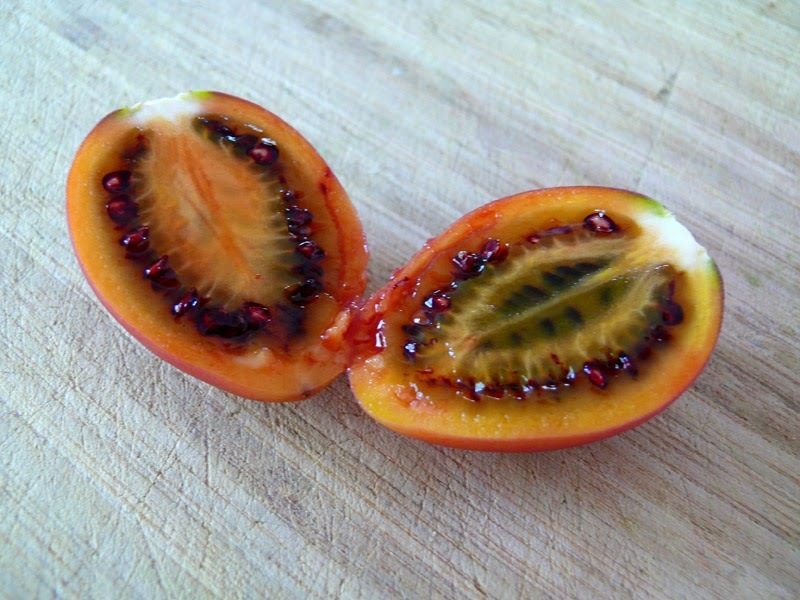 You can see why they are called a tree tomato with the seed patterns. 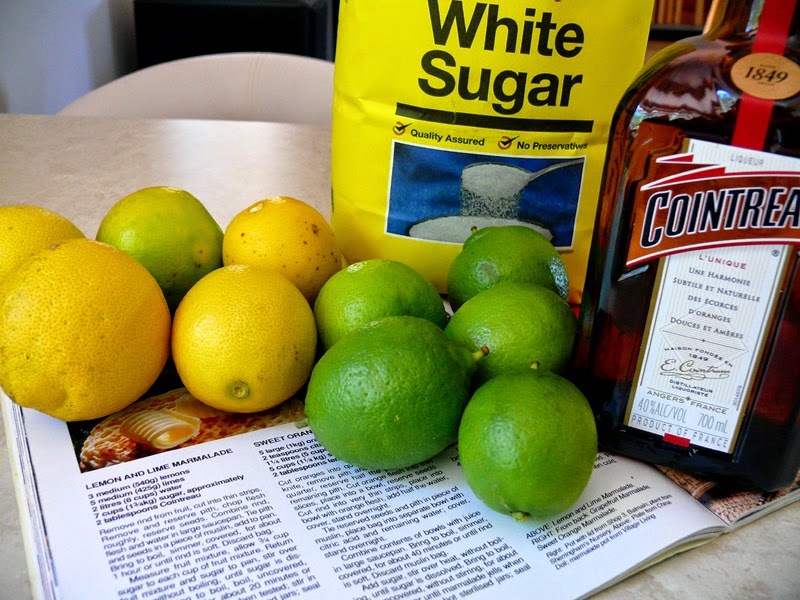 You need to eat them very ripe to get some sweetness, you just spoon the flesh out with a spoon. They are not the most magnificent fruit, pleasant without being spectacular. I just like having something a bit different. I think I'll make a batch of tamarillo jam with the next batch I pick. It's good to have a handsome helper around the place. 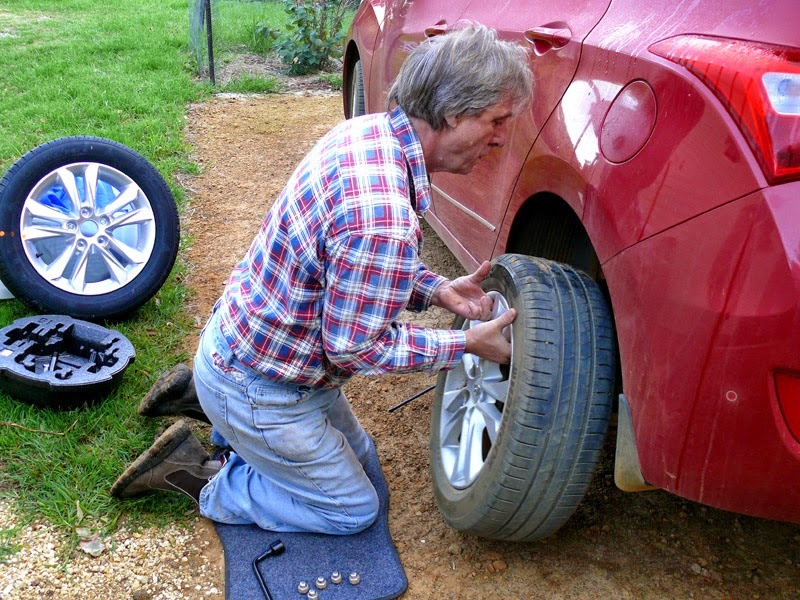 I picked up a small screw in my back tyre and it was flat as a pancake one morning. Steve kindly changed it for me and we took the wheel in for repair. I thought it was about time I did an embroidery update. I've been adding things as the whim has taken me, the whole thing is based on Casalguidi design type, being high relief embroidery. 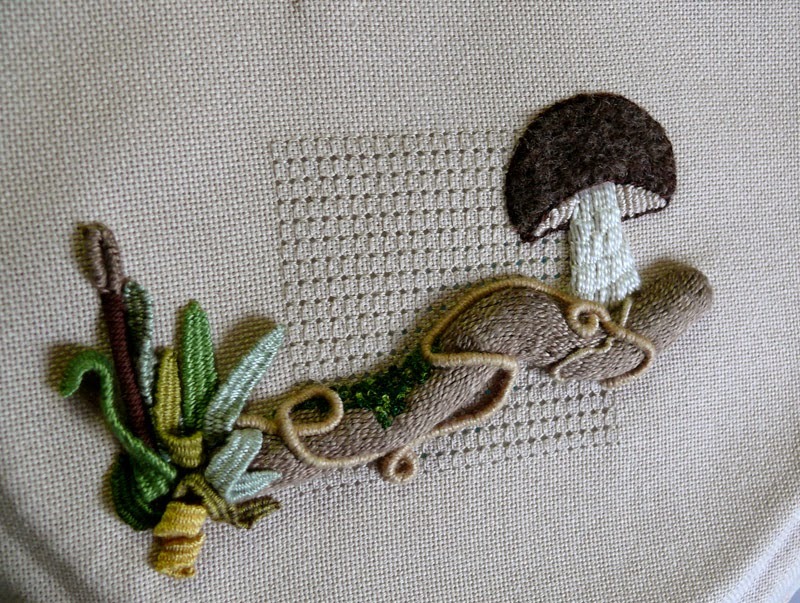 I've just started adding french knots moss along the top of the log, after that I'm not sure what to do. I think something under the log, something grassy perhaps. And on a final random note, what do you think this is? 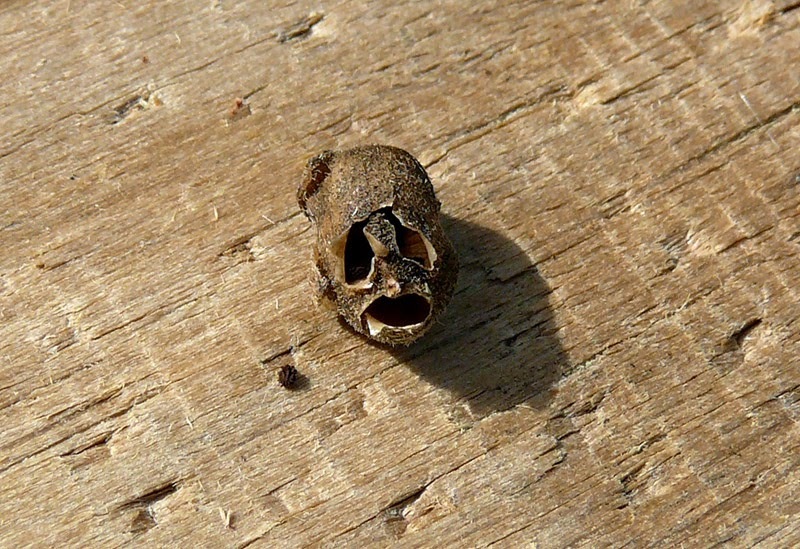 It's rather fascinating, looks like a weeny little skull. It's actually a seed pod from a snapdragon flower, those little holes form on the bottom of the seed pod and the tiny seeds fall out the holes. It's rather cute in a creepy sort of way don't you think? Lots of lovely goings on around your neck of the wood Dy... love it!